To share with you on Bloom Day! May I offer a lapis lazuli colored lichen instead? October Blue Skies and Salvia azurea aside! has been tentatively id-ed as a Squamulose lichen. instead of an apology for all the rain. this is the color I saw! but, it's not as floriferous as it usually is in October. I know you thought I was going to say asters! which really is an aster! but, the continuously hard* rains have washed the pollen out. Hopefully the sun will bring it back before the frosts take it out! False Dragonhead is still blooming. Doesn't it look more Muppet like then dragonlike? The eyes, the long nose~~Muppet! whose says red and yellow don't go together! Thank you for stopping by. . . To see more Bloom Day posts then you can visit in one day~~follow this link (here dears) to May Dreams Gardens, where Carol, our hostess and the creator of Bloom Day will link you to blogs all over the blogasphere! It's so much fun. and, now a word about Blog Action Day! in posting about the same issue on the same day. The aim is to raise awareness and trigger global discussions. Follow the above link to reach bloggers blogging about about climate change. You know, I've been whining about ALL THE RAIN! at C&L during the past 6 weeks. Prior to that we had the coolest summer I remember. 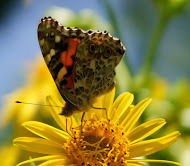 There seemed to be fewer butterflies and bees all summer long. wet winters and dry summers are struggling. here have begun to show up~~ Like this ludwigia. How it arrived~~ I can only guess. How it's thrived~~all that rain. Change seems to be in store for us. Could it mean the usual weather patterns are changing? Will we have more intense periods of rain and drought? trees will turn their lovely fall colors. Winter will arrive as usual. that are sure to arrive next year! Do you see the tiny critter hiding in there? I am glad I am not the only one who take pictures of Lichens. I have never seen one that blue. Your long term weather forecast is a bit alarming as was an article in the local paper yesterday. It suggested that we start building levees around the area now, so we will be ready for the rise in sea level when it comes. Ugh! Floods and droughts R us. Sorry, Don snuck in there, the constant rain has him in high form. Beautiful photos, Gail! The blue lichen is amazing! Around here the sulfurs are loving my pineapple sage too, there are four that just love to drink nectar all day long! way to blog for climate change! That blue lichen is stunning. It set the stage for your symphony in blue. And yes we can feel the climate changing as well as the plants. What a great blue!! Asters?? mmmm still need to purchase some....You have surely had your share of the rains!!! What a cool lichen! That's a unique find in the garden. I love the "asters" as well. Mine have all finished blooming here. I agree that changes in precipitation will be critical, and being able to cope with droughts while capturing as much rain as possible during the infrequent yet severe downpours that are likely to occur will be crucial for gardens, and plants in general. That blue lichen is amazingly true blue!! Wish we could just have gentle rainfall -- these heavy downpours are so damaging. Your blooms are wonderful, as always. I used to have Sheffield Pink and loved how fragrant it was. Such a pretty blue of lichen. It caught my eye right away. It is beautiful as are all your blues. We need it as dreary again and last night the rain came down in torrents. I can't believe how much. That lichen is very neat! I wish we have blue skies overhead. I'm very tired of being cooped up, we need to get a boat to get into the garden. Our white swan never bloomed. I think it needs moved to a sunnier location. The blue lichen is surreal! Good idea to add your Blogger Action Day with GBBD. H.
Love your 'blues' Gail I notice some blue tunes in your words as well. That lichen is really special what an intense color, totally new for me. And the Asters are astoundingly beautiful! That is all that is growing in my garden...and they are miniscule at that! Such unpredictability with this lovely planet of ours. That lichen is very striking! I've never seen anything like it around here. Lots of shades of green and grey, but nothing THAT blue. All your posies are lovely, as always. In the short term, I'm frustrated with all the rain we've had this fall. I have spent years making the garden drought tolerant and now may lose plants to this wet year. In the long term, the thought of floods and droughts to come is terrifying. I know from talking with the people around me, they are not concerned with the weather. Their response is "can't be global warming, this was the coldest summer on record". That's a gorgeous lichen, I've never seen one like it. Thank goodness for Asters, what would fall be without them. Hmm, interesting quotes about the changing weather patterns (as I sit here under a flash flood warning). It's been weird, too weird. It's nice that you can appreciate what the rains have brought though. That lichen, wowza! We have some pretty golden lichens right now but that also means the limbs will probably break on us soon! Lovely Lichen. I have never seen that blue shade before. I have one Live Oak covered with Lichen, but it is the grey color. Not nearly as pleasing, but still beautiful. I hope you dry out soon and have your usual colorful Fall foliage. I am still chuckling over your description of the False Dragonhead. You have a very vivid imagination--and now all I see are Muppets! LOL! Lots of lovely blue and other photos too. Hi Gail....I love lichen and that blue is just amazing. I have never seen blue lichen before. Climate change is definately with us. The last three years have brought very strange weather patterns in our part of the world. I do not worry for me but for the next generations.....if this continues they will have huge problems to face. Thank you, too, for all the interesting information about Blog Action Day and climate change. This has been such a strange year weather-wise that it certainly makes one wonder about overall climate change. I just heard today that the long-range forecast is for a warmer and drier winter than usual in the North and wetter and colder than normal in the South. It will be interesting to see how our gardens will adapt. That's quite an impressive collection of aster relatives! It has been a long time since I've seen a blue sky. Your fall flowers are spectacular. Great photos I like so many blues but the Lichen is unusual. Lovely blooms, lovely photos! Like the lichen. Holy cow, Gail! I was sure you were going to tell us that you had altered the color as a joke. But wowee, it was real. Too cool. Maybe we need a Garden Bloggers' Lichen Day. Photos and information all greatly enjoyed and appreciated. That lichen is unreal! I had no idea they came in such a magnificent color. I once grew the 'white swan' echinacea, but it wasn't as vigorous as the native one. Seeing your photo makes me realize I must try again. Hope your tendonitis goes away soon. Gail that blue lichen is stunning! What a magical sighting as are all of your blue flowers!Truly a colorful post! Here too it has been a dry summer and a wet cold Autumn. My garden gate now closed with a silence along the garden path. My favorite color is blue so I really enjoyed this post. This is the first time I'm seeing the Blog Action Day. Great idea and such a worthy message to get out there. Hi Gail, I have never seen a blue lichen before. I took a double take and thought no, it's not April Fool's, it's nearly Halloween. lol It really does look like lapis lazuli. Gorgeous photos. That's a stellar shot of the sulfur on the red sage. I saw the little green bee too. The Short's Aster look amazing, especially under those trees. Happy Bloom Day! I will try to do my part not only helping to create a greener world, I'll eat more cookies in honor of National Cookie Month. A lovely post ... lots to see, lots to think about ... thank you, dear Gail. Wow, that lichen is amazing! I've never seen anything like it. What a beautiful palette you have going in your yard! Sweet, you actually managed a Blooming Garden Blogger's Action Day. I ended up going for the action, and hoping some blooms will be left next month. Love the blue lichen! Amazing! Never seen anything like it. I love the picture of the asters around the tree. When the bees are there it really must be buzzing. Wow! That blue lichen is absolutely amazing. The goldenrod makes for a colorful photo. Our October seems to be cooler than normal with lots of moisture. And not nearly enough sunshine. How interesting that you've even been able to identify a plant that is probably proliferating due to global warming. It makes me wonder how many of the "new" invasives around here are the result of cllimate change. I don't know how you do it, Gail. Even your fungus is gorgeous!! Ooooohhhhh... that blue lichen! I'm digging deeply to remember if I have EVER seen anything like it... I cannot recall if I have and I don't think I would likely forget such a beauty. What a lovely accent to your beautiful gardens. Love all the asters, too... always look for those when I'm up in your neck of the woods. Hi Gail! Love that blue lichen. I've never seen anything like that before! Your False dragonhead stopped me until I realized it's Obedient Plant... the non-obedient variety (which I also have)! I purchased 'Miss Manners' this Summer, so I'll look forward to some obedient Obedient Plant! ha. Your lovely lichen is a marvel of Mother Nature. Such a glorious blue! The purple of that first Aster is so rich. I can see why purple is your favorite color at the moment. Love it on the tuteur and birdhouse! Your "Asters" (an Aster by any other name?) 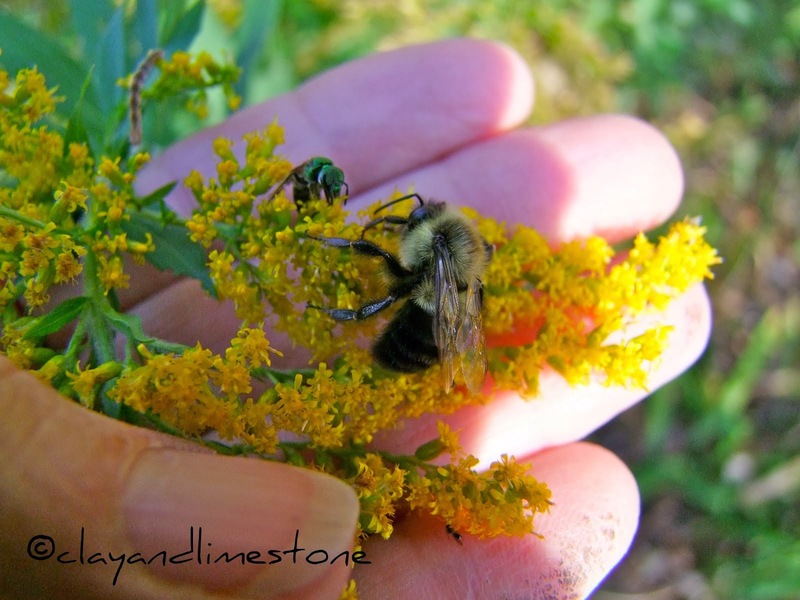 are doing a wonderful job of decorating your fall garden and feeding the lovely bees. My view of Climate change: What man does and does not do is far less responsible for climate change, if it is responsible at all, than other factors over which he has no control. Our fall started off a bit dry but has more than made up for it this week. I'm sick of the rain at this point. :( Beautiful blooms still going on in your garden. I'm pleased with my Salvia elegans this October, it's a blooming machine. We have had a dreary rainy week and cooler than normal temps but not *that* much rain- wow. Here's hoping we get to see those Daisy mums in their prime before frost. Love your pics of the Short's aster in this post~ I think you did a great job of capturing the beauty of the masses:)I can clearly see those Muppets too,lol. Wonderful post Gail! The blue lichen is gorgeous, and all the asters are so pretty. I'm glad you got some blue skies. It's gray and rainy here for weeks. This week we haven't had a single dry day. Record rains this spring, dry all summer, unusually cold and rainy fall. 18 inches really is a LOT of rain! We are having a wet fall, but nowhere near that much. Normally it's clear blue skies and pleasant temps this time of year. Love the Blue & that blue lichen---I've never seen it before. I sat on the bench in front yesterday to rest a bit & I saw a baby bumble go inside a Torenia bloom. He was so small to fit into that little bloom. I have the pink & lt to dark blue or lavender color. They came back from volunteer from yrs ago. I was shocked but pleasantly surprised. The lichen is stunning! At first glance I thought blue petals from a flower had fallen. I'm now kicking myself for not picking up some asters at the Lowe's sale yesterday. Wow! That lichen is truly a beautiful piece of nature! Lucky you to be receiving so much rain, my garden is starving for water. It looks like your garden is loving it...you have so many lovely fall blooms. I saw your post the other day, but must not have read it all or commented. If you do comment moderation, then, I could have left a comment, but I don't think I did. Anyway, I did read it all today, and remembered parts of it, but not all of it. I used to think since our weather seems to be cooler instead of hotter, that people who talked about global warming didn't know what they were talking about. I'm still not as educated about it as I could be, but I heard somewhere about changes in the weather patterns caused by the melting glaciers and other factors. Global warming doesn't mean your area is steadily getting warmer, if I'm understanding that correctly. We need to understand that what we do can have an impact on the environment, but not go around beating ourselves up, either. Hey, I could have done a post on the subject! Well, I loved your photos, as always. The color of the lichen is beautiful! Wow, I've never seen anything like that blue lichen. It's gorgeous! Just found your blog and I'll be back often. I love it! Wonderful colors in your garden, Gail, and the purples and blues and yellows are just stunning. Pale blue-gray lichens on the Arizona Ash are the only ones I see here, Gail - yours is spectacular! The blue reminds me of the Cupric sulphate crystals people used to use to keep tree roots from growing in water pipes. The asters I bought years ago turned out to still belong to Asters - have the old world Aster frikartii 'Wonder of Staffa', but the only way I know is that it was written down.